Articles by: "Damian Radcliffe, Carolyn S. Chambers Professor in Journalism–University of Oregon"
All of these trends are likely to further disrupt media markets and digital content companies. Of them, blockchain is getting a lot of attention at the moment. And rightfully so. Identified last year by PwC as one of eight breakthrough technologies that “will be the most influential on businesses worldwide in the very near future,” it’s an innovation which has excited investors, business and governments around the world. The global blockchain market is predicted to grow from USD 411.5 million in 2017 to USD 7,683.7 million by 2022, at a Compound Annual Growth Rate (CAGR) of 79.6%. The technology has the potential to impact multiple areas of interest to media companies, including: payments and contracts, as well as content distribution and digital asset management. According to one advocate for blockchain, Gil Beyda, Managing Director of Comcast Ventures, there are good reasons to be excited by this nascent technology. “The internet connected people and businesses with near zero cost of distribution. However, the network still required intermediaries (website, etailers, etc.) to aggregate people and content/goods and provide a trust layer for transactions,” he explained in an email to Digital Content Next. As a result, Comcast, like a number of other media companies – such as Spotify – are exploring the potential afforded by blockchain to create (and support) new, and existing, business models. “Comcast has announced the Blockchain Insights Platform with NBCU+Disney+Altice+Cox and others to match audience datasets — without sharing data — to better plan, target, execute and measure advertising,” Beyda told us. “Another internal project enables IoT devices in the home to use blockchain to secure and control access. Others at Comcast at looking at consumer loyalty programs and energy management,” Beyda says. 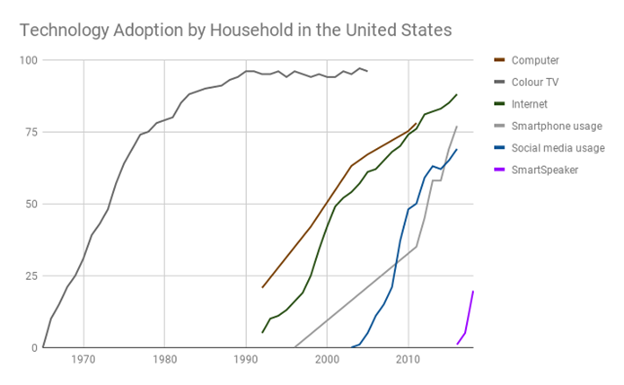 With Intel predicting that the average household will have 50 connected in-home devices by 2020 (up from ten in 2016), Comcast join Google, Amazon and others at the intersection of media and tech, who are operating in the increasing busy connected-home market. Arguably it’s the payment and distribution opportunities afforded by this technology which will pique the interest of many content creators and rights holders. Meanwhile, companies like MetaX are exploring how blockchain can address issues of viewability and ad fraud by recording and storing detailed real-time ad impressions, and others have argued that blockchain technology (which allows users to trace, chronologically, any changes) can also be used to address issues of fake news and content manipulation. Dan Williamson, CEO and co-founder of The-BLOCK.io, agrees: “We believe blockchain technology will have a huge impact on the media industry,” he told Digital Content Next. Although Pon believes that “media companies are sleepwalking into this next technology maelstrom, without knowing what’s going to hit them,” the experience of Gil Beyda and his team at Comcast Ventures indicates that there are some blockchain cassandra’s out there in medialand. “I believe we’ll see applications of blockchain technology in production in the next 1-2 years,” Beyda predicts, suggesting that the evolution of this technology – and the myriad of benefits it could potentially unlock – might become more mainstream sooner than you might realize. And no discerning media company wants that. Matthew Schroder, a Doctoral Student at the University of Oregon’s School of Journalism and Communication contributed to the research for this article. The past 12 months were pretty brutal for large swathes of the media and creative industries. We witnessed unpresidented (sic) attacks on the mainstream media from the Oval Office and White House surrogates; digital darlings like BuzzFeed and Mashable, missed targets, laid off staff or saw their businesses valued at a fraction of their previous levels. Meanwhile, the #MeToo campaign rightly garnered considerable attention, with its ramifications still being felt in early 2018. “Journalism needs new revenue models, particularly ones that align all our business incentives with our editorial ones,” Wired‘s editor-in-chief Nick Thompson wrote in a recent Facebook post. 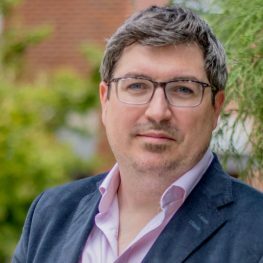 His comments came at a time when both Wired and The Atlantic, publications which have predominantly eschewed these income models, have decided to pivot to paywalls. Previously these outlets have typically encouraged readers to “whitelist” their sites, bypassing audiences ad-blocking preferences. Meanwhile, The New York Times — fresh off the back of hitting record levels of subscribers — has decided to halve the number of articles it offers for free each month (from 10 to 5), as it seeks to further grow its subscriber base by putting more content behind the paywall. The move mirrors a similar approach in 2012, when the Times reduced the number of free articles non-subscribers could access from 20 to 10. Efforts to generate more paying consumers, and to double-down on opportunities to create additional income from loyalists, are understandable. Firstly, is there enough money to go around? Will 2018 be the year when we hit peak-paywall? 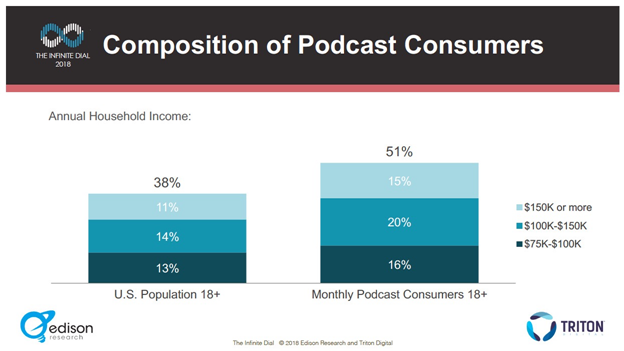 Afterall, general audiences have historically been pretty reticent to pay for content. Secondly, if there is a finite pot of subscription monies to go around (and I believe there is), then local news outlets are the ones most likely to suffer. They don’t have the scale that national and international outlets can potentially tap into. That’s an outcome which if far from desirable, given the pressures the sector is already under. To counter this, local newspapers (the medium most at risk) will need to aggressively make the case (to readers and advertisers alike) that supporting their outlet isn’t just about your own consumption needs, it’s also about supporting the type of society you want to live in. And that’s one where we should guard against the expansion of media deserts, and stress the need for strong original reporting from across all parts of the information ecosystem. If 2017 was the year of “fake news” and “alternative facts” then 2018 promises to be a year where the media landscape risks becoming even more partisan and polarised. In the coming months, we won’t just see missteps and mistakes in the mainstream media being weaponized, we can also expect to see regulation, competition rules, as well as M&A activity, being increasingly viewed through a political lens. As a case in point, consider the AT&T – Time Warner case, Sinclair’s proposed Local TV expansion, or that the FCC’s decision to overturn net neutrality was split down party lines. Against this backdrop, it will be interesting to see how the huge Disney-Fox plans play out. Whatever your political persuasion, it’s hard not to detach the different approaches being deployed here from the current political climate. That may always have been the case, but in 2018, this promises to be more overt than ever. The implications of these developments, of course, will resonate far beyond Washington and the boardrooms of Fortune 500 companies. Changes in net neutrality rules may make it more difficult for local players and start-ups to afford new access fees; it will certainly be much harder for them to access the super-fast highway than content creators with deeper pockets. 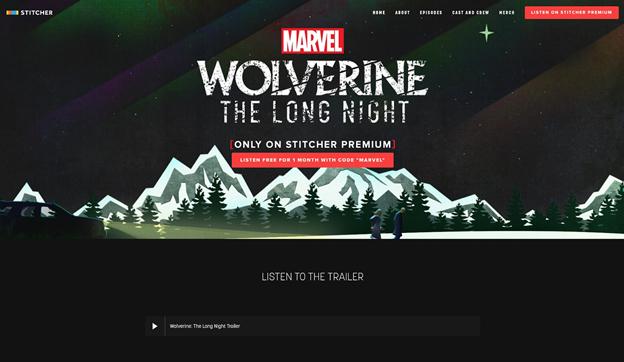 Moreover, consumers may find themselves facing higher internet and phone bills, more politicized local news coverage, and the need to subscribe to yet another OTT service, as Disney launches its own on-demand products and removes its content from Netflix and other rivals; as it seeks to grow its own audience (and direct revenues) in this space. Despite the financial implications, it’s a move that becomes more appealing to mouseketeers the world over if/when Fox’s vast library is also folded into the mix. 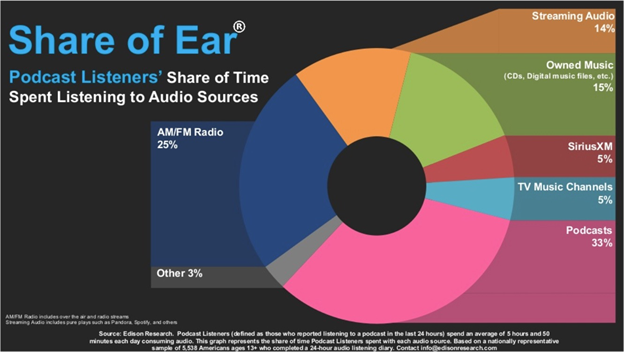 Writing on these pages at the end of last year, Mark Glaser, Founder and Publisher of MediaShift, highlighted how we are already witnessing considerable interest – from publishers and platforms alike – in Audio and Voice as potential delivery platforms. 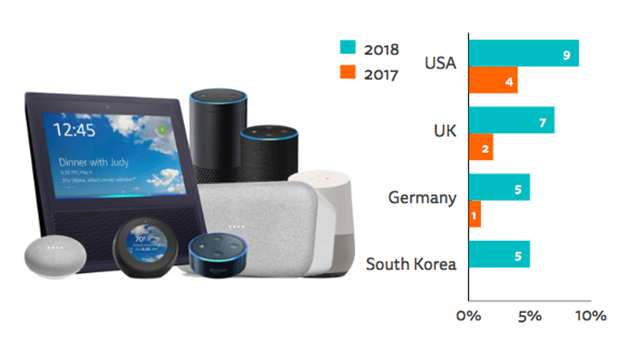 Even though it’s early days for products like Amazon Echo and Google Home, research from the Reuters Institute for Digital Journalism indicates some of the potential. CNN, the BBC,Wall Street Journal, and many others all experimenting with these technologies. 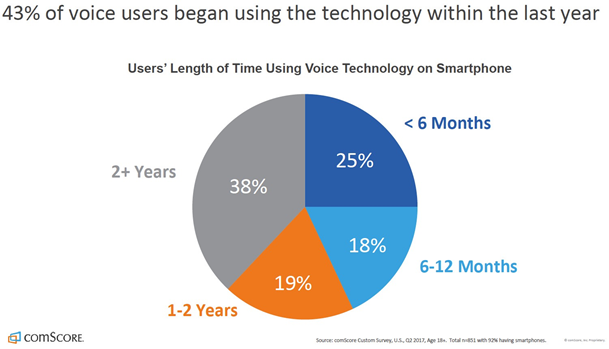 Voice assistants have the potential to transform local search and content, with local newspapers joining NPR, the Washington Post, and a plethora of other publishers, who are exploring whether these platforms can deliver new audiences and fresh opportunities for monetization. To these digital horizons, of course, we also need to add Augmented Reality (AR) and Artificial Intelligence (AI). Perhaps that will change in 2018, not least because I expect Facebook and Snapchat to get much more behind these tools/platforms, especially AR. Facebook has already made some noises about this; and just as they incentivised publishers and celebrities to help kick-start their live video offering, it’s not unreasonable to expect they may take a similar approach to another format that they’re particularly keen to grow. Finally, with AI tools already being used for live reporting, work being done by agencies, and the automation of some content – such as the local news experiment, supported by Google Digital News initiative – this fast-moving technology remains one to watch. How you categorize, these digital-led developments (the good, the bad and the ugly), will vary – depending on your particular standpoint. But, these new realities cannot be ignored. Each of these trends has the potential to impact your bottom-line. For good or ill.
As we enter the end of the current decade, the media landscape probably feels more like the wild west than it has for some time. The impact of the three topics outlined here, coupled with ongoing strategic considerations — such as ad-blocking, the consequences of changes to Facebook’s algorithm, and the continued reliance on many third party platforms and services — means that many media companies continue to face an uncertain, unpredictable, future. Yet, at the same time, this uncharted territory also offers tantalizing prospects for content innovation and potential opportunities for new revenue streams. The world is full of digital cowboys, but with 2018 promising more paywalls, evolving policy and the growth of emerging tech platforms, media companies may need a few more gunslingers. Change is in the offing, and as a result, execs will need to carefully marshal their resources, and once again saddle up for another year where change and opportunity will go together hand-in-hand. The UK TV industry has always punched above its weight class. Smaller than Oregon, with a population equivalent to that of California and Texas (66 million), the British TV sector is a vibrant £14 billion a year ($18.58bn/yr) business, which has created formats, content, and executives, who have made their mark around the world. We know that millennials consume content differently. They’re more likely to watch video content on devices like smartphones and laptops than older demographics. They’re less likely to watch TV-like services on an actual TV. Against this backdrop, in 2016 the BBC made their youth targeted TV network, BBC Three, online-only. In part, the move reflected the fact that younger audiences are increasingly consuming less linear TV. But, it also yielded major savings (estimated at c.£30 million / $39.6 million p.a.) as the online-only service requires less original programing, and isn’t burdened with the same transmission and distribution costs. The BBC’s move didn’t just make financial sense, it was also an effort to more explicitly take content to the spaces that their younger audiences inhabit. British viewers have grown up in an environment where TV advertising is much less pervasive. The BBC, for example, has no adverts at all, just trailers for other BBC programs and services. “Seven in ten (67%) say they like to watch TV programs and films on demand to avoid adverts, or because there are no adverts,” UK communications regulator, Ofcom, recently noted. This preference – coupled with the use of ad blockers on web based TV services – should be a cause for concern, given the continued importance of traditional advertising. One potential solution, explored by the UK’s oldest commercial broadcaster ITV, is to offer a premium IP delivered service that mirrors the ad-free experience provided by HBO and Netflix. In 2013 the network launched an iOS app that allowed Apple users to watch the last thirty days of their content (from five different TV services) without advertising, as well as live simulcast of ITV3 and ITV4, for £3.99 ($5.27) per month. The service, called ITV Hub+, has now been rolled out to other platforms including Smart TV’s. (It also costs £3.99 a month.) Will consumers pay more for this convenience? Evidence suggest they will, and this is therefore a model that other broadcasters may want to emulate. Given the range of ways in which audiences consume – and access content – it’s increasingly incumbent on broadcasters and other content providers to be as accessible as possible. The BBC iPlayer, an internet streaming, catchup, television and radio service from the BBC, which celebrates its 10th anniversary this year, has always been available across wide range of devices, including mobile phones and tablets, PCs, gaming devices and Smart TV’s. BBC Three, their youth orientated service, doesn’t just live on the BBC’s own app and web services, it also has its own YouTube channel with full episodes – and entire series – available to watch. Other UK broadcasters have followed suit. The ITV Hub, for example, is now available on 30 different platforms, including Google Chromecast, and Xbox. At the end of 2016, the broadcaster noted that consumption (the measure of the number of hours watched) is up by 43% in the past year; and, interestingly, that Live TV accounted for c.30% of all requests. On-demand services like Amazon, Hulu and Netflix have changed viewing behaviors. As a result, traditional broadcasters need ask whether they too should go “all in” and do things differently. That might mean releasing new series in their entirety, offering new content for download and offline viewing (which the BBC and others offer) as well as providing “digital boxsets” so that audiences can binge on older shows. These moves are not just designed to protect revenues and audience share, they also reflect evolving consumers behaviors. Failure to respond to these expectations means that traditional broadcasters risk being left behind. It’s not just online ads that are often terrible, many TV commercials aren’t great either. 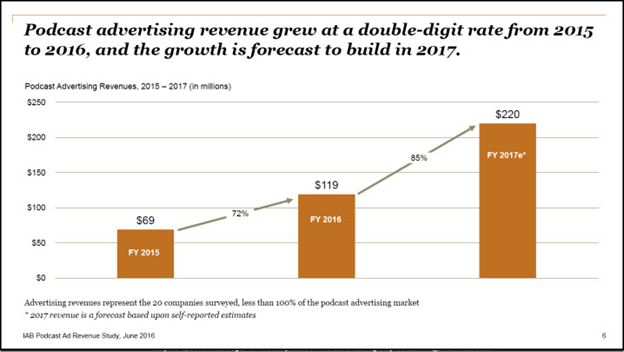 And yet, we continue to watch a lot of TV, creating prime conditions to deliver strong, effective, advertising to captive audiences. 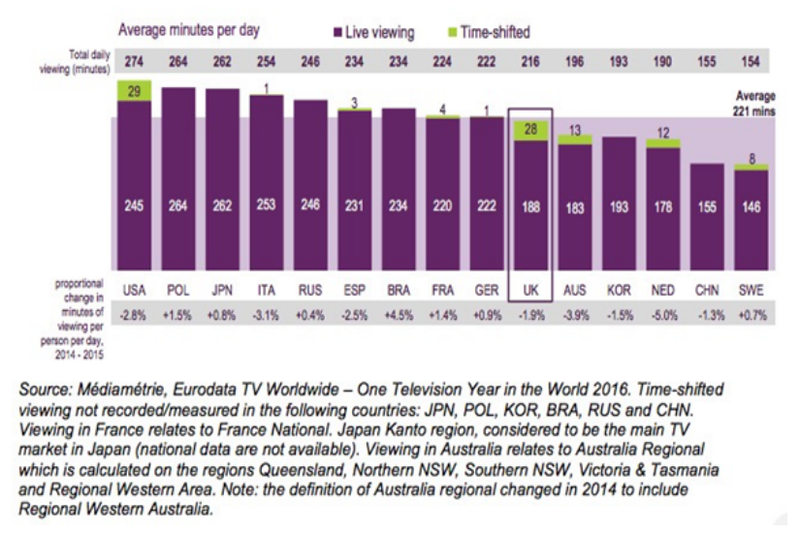 Data from Ofcom’s 2016 International Communications Market Report, found daily TV viewing was highest in the United States (274 mins a day) and lowest in Sweden (154 mins). 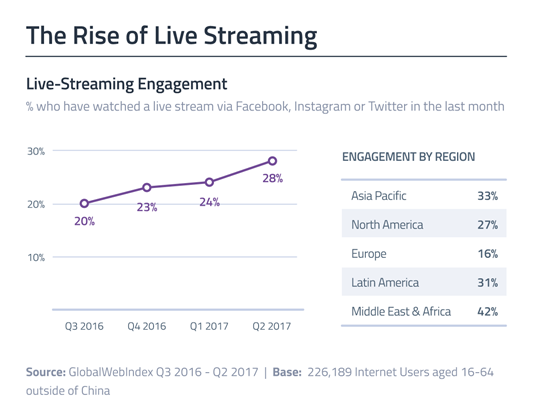 That’s a lot of screen time (most of it live viewing) which, when coupled by the mass audiences TV can still reach, continues to remain attractive to many advertisers. TV’s mass reach makes it an appealing medium for advertisers. Yet, at the same time, we also know that audience’s attention is increasingly fragmented. For many younger audiences, TV is already the second screen, and has been for some time. 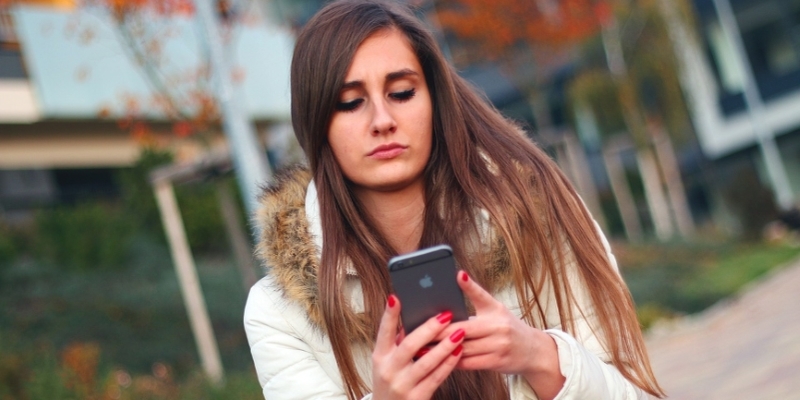 As far back as 2012, the Pew Research Center found that 58% of smartphone owners used their phone to keep themselves “occupied during commercials or breaks”. But, Pew found, respondents were often engaged in second screen activity related to what they were watching. This resulted in advertisers trying to find new ways to engage audiences on their second screen. (See some great examples below targeting Game of Thrones fans). How some advertisers have tried to engage Game of Thrones fans on Twitter. More recently, access to greater consumer data has created new advertising opportunities such as programmatic TV advertising and “addressable TV advertising”. Personalization, time-shifted ads and the use of products (like Sky AdSmart in the UK) to serve different ads to different households (or different people in the same household) against the same content, may still be relatively small markets, but they’re expected to grow quickly. As such, they’re a technology that broadcasters need to be doing more than keeping an eye on. In 2016, TV revenues in the UK were worth £13.8bn, a figure which is remarkably resilient considering that TV revenues in 2011 stood at £13.3bn. The sector’s revenue mix has also proved to be surprisingly durable. In 2016, 30% of UK TV revenue was generated by advertising, compared to 29% in 2011, subscriptions accounted for 46% of revenues in 2016 and 44% in 2011, and broadcasters enjoyed 30% of total UK display advertising in 2016, down just 1% from five years ago. However, this relative stability doesn’t mean that sector can rest on their laurels. Finding new revenue sources, remains important. 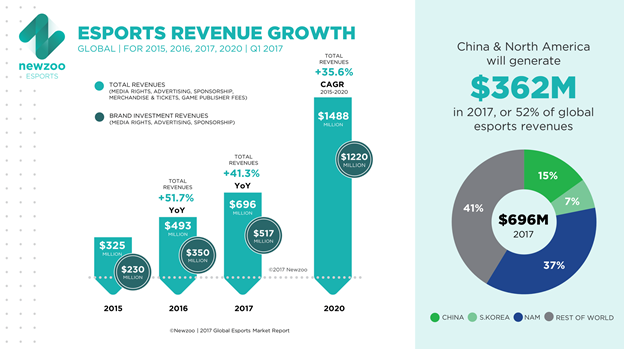 And in this space, online revenues are growing fast. 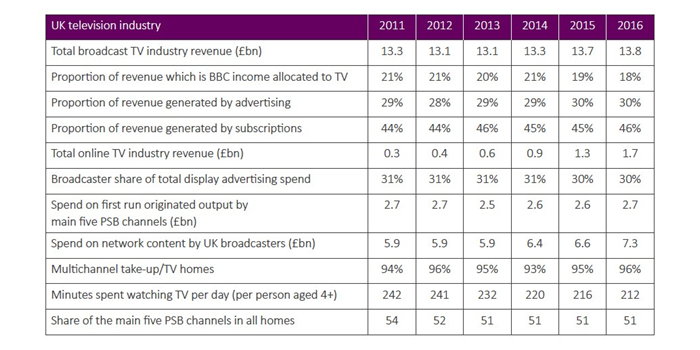 In 2011, online revenues were worth £0.3bn for UK TV companies. Jump forward to 2016, and this figure was £1.7bn, a substantial increase. Given this rapid growth, and stagnation in other areas, expect more efforts to be focused on this space. That’s not going to change any time soon, but as viewing habits on both sides of the Atlantic continue to evolve, so broadcasters and advertisers need to refine their strategies accordingly. This means finding new ways to capture attention, serve relevant – and increasingly targeted – ads, and experiment with new revenue models. Three areas that I believe merit more attention are: more flexible pricing models – recognizing that many audiences love to watch certain shows, series or events, but that they don’t necessarily want (or can afford) a year-round subscription – simulcasting shows (nationally and internationally) to prevent piracy, and identifying opportunities to both reduce churn, and discourage the illegal sharing of logons and subscriptions. What we see in the UK, as well as here in the US, is that although TV’s business model is changing, there are opportunities to diversify both content distribution and income strategies. How broadcasters continue to respond to the challenges – and opportunities – presented by digital disruption, is a subject many of us will continue to watch with interest.